Money makes the world go around. It’s what most of us work for, want and need more than anything else, and, sadly, live for. Money even plays a huge role in the games we play, time that’s meant to be spent as a distraction from the real world and its burdens. What’s even more bizarre is that this in-game currency often represents real life money – dollars. Robot Inc. Idle Cash Clicker & Tap Factory Empire takes this to another level. Not only do you earn the green stuff, but plenty of it. You’re in charge of a tower block, each floor home to a different factory. Starting from the ground up, you build a business up until you’ve earned enough to purchase the floor above. As your factory expands, you begin earning more and more money. For example, you might start earning $4 a second at the Bicycle Factory, but the Watch Factory two floors above will earn you $10,000s instead. This goes all the way up the tower until you reach the Roket Factory, a company that costs a whopping $23 billion. That seems like an insurmountable cost to begin with, but there are methods you can use to increase the amount you earn and shorten the amount of time you earn it in. There is an upgrade button within every business. Every time you press this it costs money, but it increases the amount of revenue you receive. Press it enough times, and the speed at which the business operates improves. Then, when you’ve earned enough, you can employ someone to collect the cash for you, so that you earn when offline. Once you’ve reached the top and earned enough money, you can trade it all in for fame. This resets the game, but you’ll be rewarded gold stars depending on how successful you were. These can be spent on improving operations in future rounds. Alternatively, you can purchase blue crystals which actual money, which can then be spent on gold stars or cash. Rather than simply asking you to click and collect, Robot Inc. Idle Cash Clicker & Tap Factory Empire forces you to be tactical about where you invest your money. If you invest too heavily in a new business, an older business might not be bringing in enough revenue. This means you need to wait longer for the new business to generate cash to then invest further in it. Instead, if you build from the bottom up, all bussinesses work in synchrony to ensure you’re not waiting hours for in-game currency. It’s interesting that in-game currency is no less addictive than cold, hard cash. Perhaps Robot Inc. 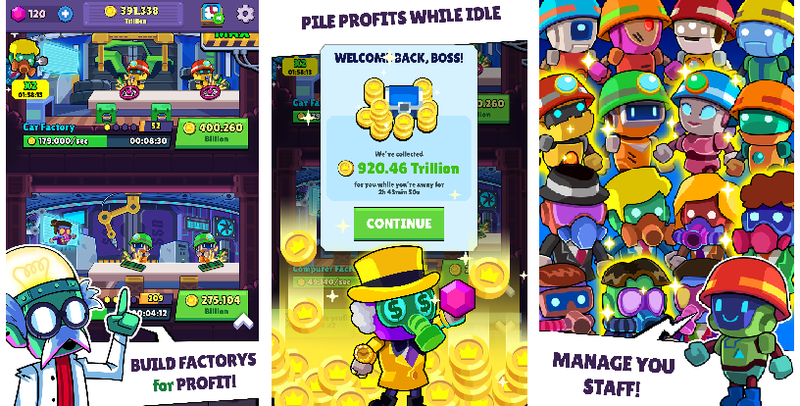 Idle Cash Clicker & Tap Factory Empire takes advantage of this by allowing you to pay with actual money, but the game’s still as enjoyable without investing your own money into it. It can take a while for factory to generate profit, but the fact that you can still invest in the more affordable factory stops you from getting bored. And the fame currency gives you another reason to essentially play the same thing over and over. Even knowing that Robot Inc. Idle Cash Clicker & Tap Factory Empire is a simple game that requires being replayed constantly doesn’t put me off, and that’s a sign of how enjoyable it is to play.